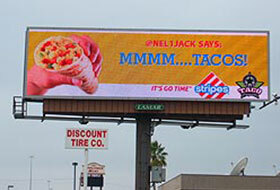 Total out-of-home advertising revenue increased in the fourth quarter of 2013, as well as the full year, according to the latest figures from the Outdoor Advertising Association of America. In the fourth quarter, revenues were up 3.5% compared to the same period in 2013, while full-year revenues increased 4.2% to $6.9 billion. This marks the 15th straight quarter of year-over-year growth for out-of-home revenues. The biggest categories in terms of percent growth last year were restaurants, up 11%; insurance and real estate, up 9%; schools, camps and seminars, up 8%; miscellaneous services and amusements, up 6%; and retail, up 5%. Turning to individual companies, the biggest advertisers last year were, in order: McDonald’s, Apple, Verizon, AT&T, Warner Bros Pictures, Chase, Samsung, MetroPCS, Microsoft, and Citi. 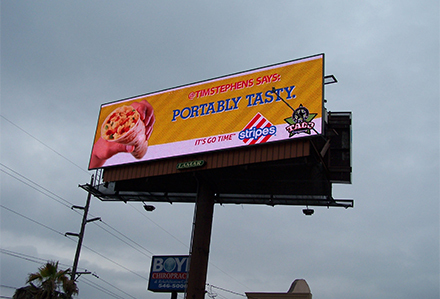 One of the main factors contributing to out-of-home revenue growth is digital out-of-home video. Separately, a recent study from PQ Media found that global consumer exposure to digital out-of-home media increased 75% from eight minutes per week in 2007 to 14 minutes per week in 2013. According to PQ Media, key drivers of DOOH growth included consumers spending more time with media away from home; increased engagement with DOOH screens linked to wireless devices, longer work commutes, and more time devoted to leisure and shopping. Turning to the future, PQ Media forecast that DOOH exposure is projected to increase at a compound annual growth rate of 8.6% in coming years, reaching 20 minutes per week in 2017, which, in turn, should fuel a 14.2% cumulative annual growth rate in DOOH revenues over the same period. Lamar Advertising Company (Nasdaq: LAMR), a leading owner and operator of outdoor advertising and logo sign displays, announces the Company’s operating results for the fourth quarter ended December 31, 2013. Ashley Shipley, director of social media and online marketing at Matrix Media Services, talks to Media Life about why social media is vital to out of home, which advertisers have done it well, and how OOH ideas have evolved with the increase in social media usage.